It is with great pleasure that ARTINFOINDIA.COM introduces the exhibition, ‘Creative Portrait Art Exhibition 2016' carefully put together to create a common platform for the artists across the country and to celebrate the power of our visual idioms. On View at Lokayata Art Galley, Hauz Khas Village, New Delhi. 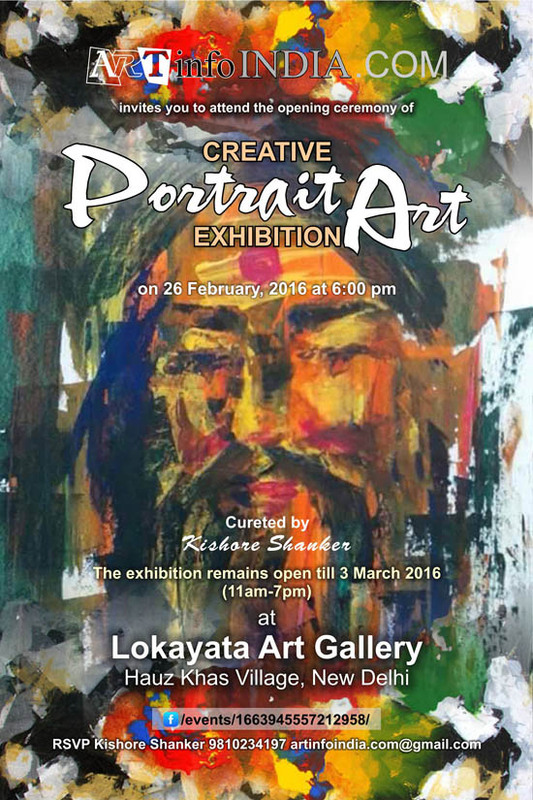 This show ‘Creative Portrait Art Exhibition' reveals aesthetic emotions and cognitive state of mind of an artist be it a painter, photographer or a graphic designer. Portrait art existed throughout the ages as documenting the existence of man after death. However, portrait painting is reduced to great extent by the invention of Camera. With the passage of time photography is also considered as visual form of art. The present exhibition is curated by Kishore Shanker Founder of ARTinfoINDIA.COM with the motive to show the creative qualities of portrait artists of various streams who have infused aesthetic expression in their art. Can I also participate … and how?